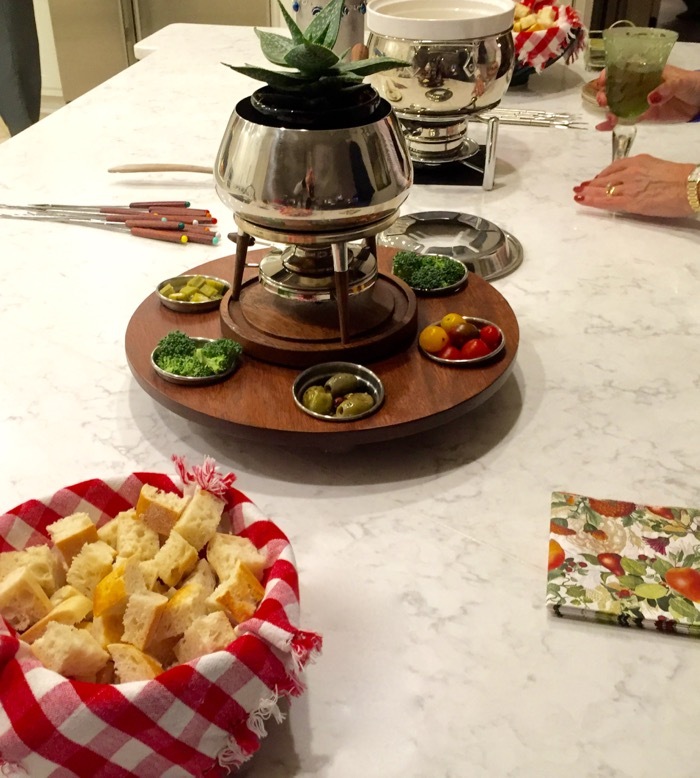 Several years ago, our family resurrected a 70’s fad…The Fondue Party… and began a new family tradition. I bought several fondue recipe books and began to experiment. We had many a good night around the fondue pot in the North Carolina mountains. During the final days of February pretending we were in the Swiss Alps or skiing in Colorado (and not at the beach) we decided to throw a Friday Night Flicks Fondue Party. I have a very nice Williams Sonoma Fondue Pot perfect for my cheese fondue… I wanted to serve several different fondue recipes and decided to scour the vintage stores to find a new/old fondue pot! I had a blast and found this perfect vintage one at The Pickers Market in Fernandina Beach, FL. Normally this style pot would be great for Fondue Bourguignonne, traditionally using meat or chicken cooked in hot oil. The small pots are perfect for different dipping sauces. 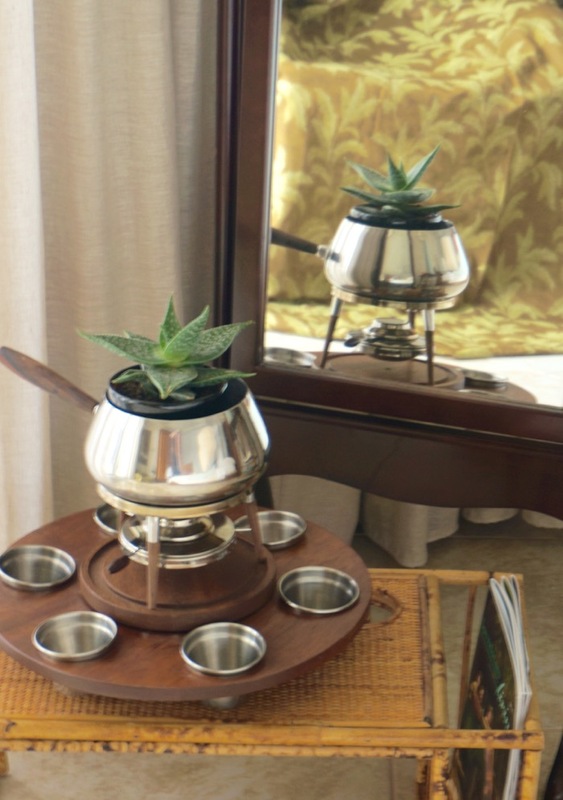 If you are wondering why I stuck a beautiful succulent plant in the fondue pot…I have a Wolfe induction cook top that will not heat without a certain stainless pot. (Most fondues are best heated on the stove top first and then transferred to the fondue stand.) 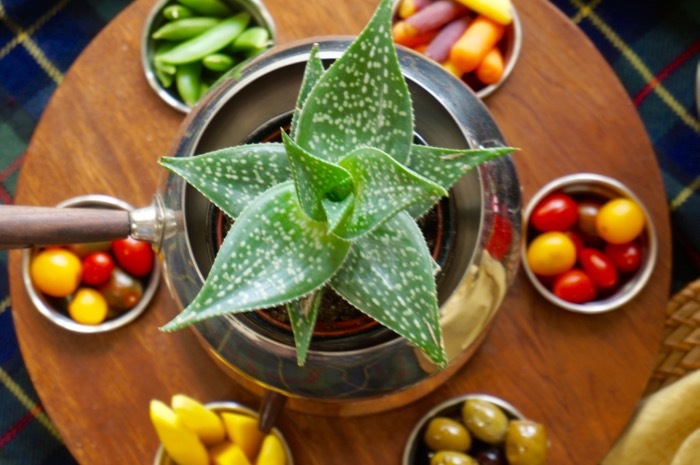 I decided to use the dipping pots for a variety of vegetables and fruit. I served a traditional cheese fondue and an appetizer version of crab cake fondue. This red Cuisinart Fondue Pot heats well on my Induction cooktop. The word fondue is derived from the French fondre, meaning to melt. It originated in the Swiss Alps using the few ingredients on hand during winter when fresh foods were not readily available. 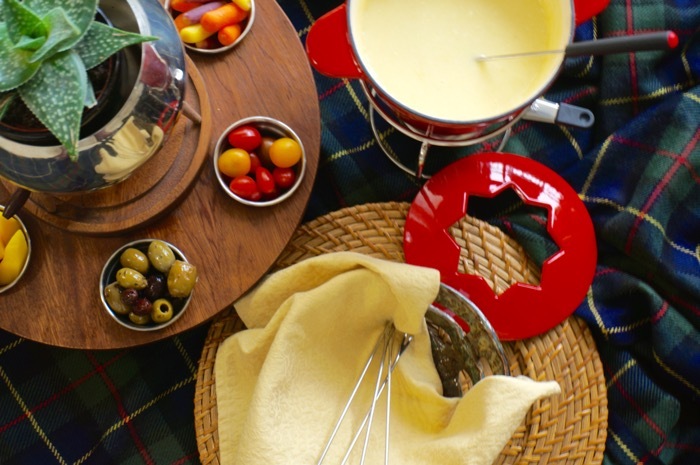 Most cheese fondues are made with Swiss aged or hardened cheese, day old bread, white wine, and cornstarch. The cheese should be melted slowly using a wooden spoon to stir with a figure 8 motion. I’ve included recipes for my 2 favorite cheese fondues. Toss the shredded cheeses in a large bowl with the cornstarch and dry mustard. Rub the bottom and sides of fondue pot with cut side of garlic halves. Add the wine and heat to a strong simmer. Lower heat to medium. Add cheese one handful at a time, stirring constantly with a wooden spoon. Stir until each handful melts before adding another handful. The mixture will slowly thicken. When all the cheese has melted, place the fondue pot onto stand and light the fuel can. I served with crusty bread cubes and a variety of vegetables for dipping… broccoli, olives, pickled okra, carrots, mango slices, apple slices, red pepper slices, boiled shrimp…Use your imagination! 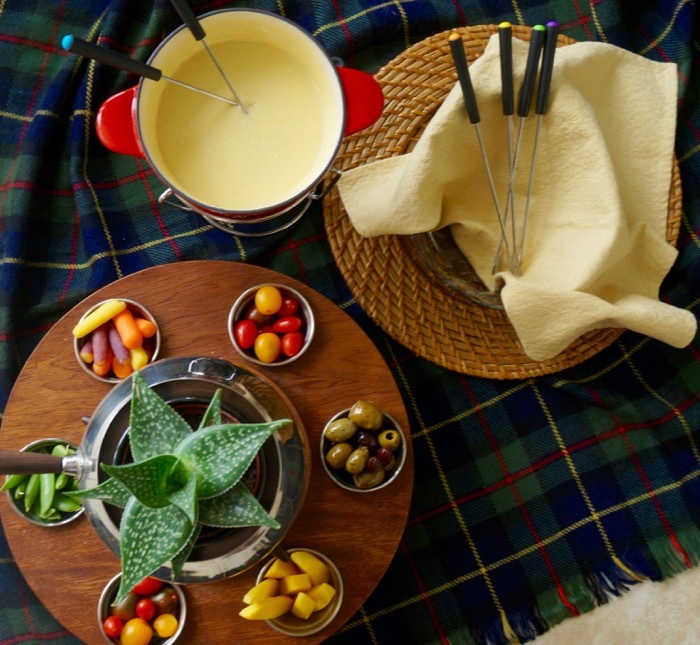 Another favorite cheese fondue has an Italian flair. This one adds a pesto sauce! Rub a fondue pot with garlic. Pour in the wine and heat over medium-low heat until hot. Toss the cheeses with the flour to coat. Add the cheese, a handful at a time, to the wine, stirring constantly and waiting until each handful melts before adding the next. Transfer to fondue pot stand, lighting the fuel can. Just before serving, swirl the pesto over the top of the fondue in a decorative pattern. Serve with bread cubes or vegetables...And dip away. Process the basil, garlic, and walnuts in a food processor fitted with a steel blade. With the machine running, pour in the oil in a thin, steady stream. Add the cheeses, a big pinch of salt, and freshly ground pepper. Process briefly to combine. Remove to a bowl until ready to use. The freshly made Pesto is nice especially if using on a pasta dish, but if you are short on time, buy one already made in your local grocery store. The fondue does not require a large amount....Sometimes easy can be better. This crab cake fondue was also very good and had a little kick thanks to the jalapeno pepper and Old Bay seasoning. Set the fondue pot over medium heat and add the oil. Once the oil is hot, add the chopped vegetables and 1/4 teaspoon of the salt. Cook until the vegetables have softened, about 5 minutes. Add the white wine and cook until it has evaporated. Stir in the half and half. When warm whisk in the cream cheese one piece at a time until melted. Add the cheddar cheese one handful at a time, whisking to combine. Once the cheese has melted, stir in the crab, Old Bay, remaining salt, Worcestershire and Dijon. Place the fondue pot on the stand. Light the fuel can and slowly adjust to the lowest flame. As mentioned in my previous Valentines Day post…we did have fondue…we did watch the famous Sabrina movie starring Audrey Hepburn, Humphrey Bogart, and William Holden…We did laugh at the soufflé scene. Come celebrate with me! I’ll save you a seat at the table…or in this case…around the fondue pot! What a great idea. I am going to have to plan a fondue party. Idea brought back some great memories. Thanks for your comment Nancy! We had a great time. Really loved the two cheese fondues! Let me know how your party goes. Loved the 2 cheese fondues. Thanks for your comment! I love the vintage pot!! Wish I had been there to hunt for it with you! Wish you had been here with me too. You and I are the best at discovering old vintage finds…Think I will have to do a post on my PBR bench that you and I found in NC…Still is on the porch and Dave still does not know how much we paid for it. Robin’s and Kathy’s secret! Kathy, your timing was perfect as Rachel and I we’re just talking about making some fondue on one of our cold winter nights here in Tennessee. Now I just have to find our two pots that are stored some place in the attic. Thanks, your pictures were great. We had such fun. Can’t believe you have 2 pots in the attic! You do need to get them out and have a fondue party. Hope to see you in NC mountains this summer! The crab cake fondue was my favorite, the jalapenos add a nice kick with the cheese. Looks yummy! Ah, the 70’s …..
We had fun trying different food to dip. The pickled okra was actually great dipped in the cheese fondue. All I can say is YUMMMMMM. And a pesto fondue?? OMG. Thay all sound delish! The pesto adds a different twist. And the pattern…Stir with a figure 8 motion. Wow !! !’ Love this site. Makes me hungry !